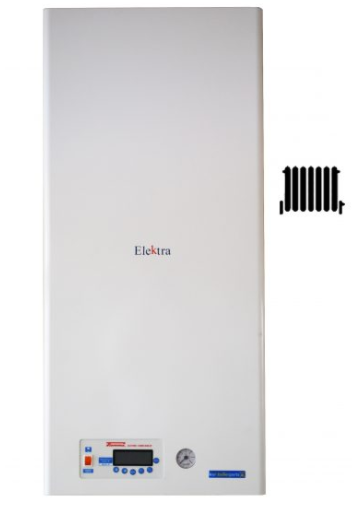 The Elektra N electric Heating only boiler is fully IMQ tested, CE marked. 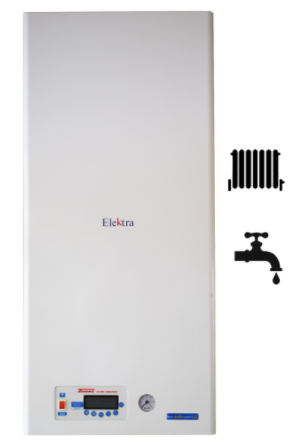 Elektra N allows you to replace system boiler without the need of any extra plumbing of pump, controls and expansion vessel as they already built in. Simply connect to flow and return of conventional system and Elektra N takes over. The main heating chamber has no internal restrictions, therefore not prone to blockage. The boiler is also digitally controlled, allowing it to regulate precise temperatures. 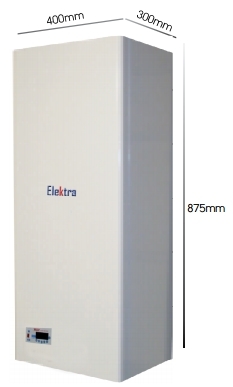 The Elektra C electric combi boiler is fully IMQ tested, CE marked. Designed for 1 bathroom facility and numerous radiators. 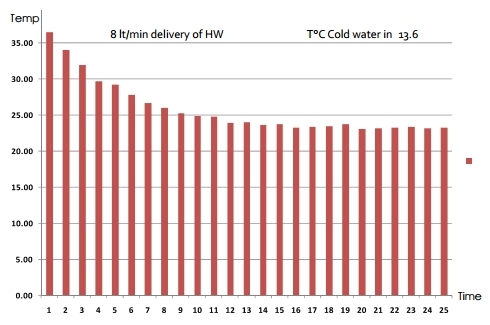 Delivers continuous hot water at 8lt/m see chart below. Electric boilers are 100% efficient and remove the need for flue pipes, CO detectors or condensate discharge. They are not only silent but also use fewer parts, and those parts are inexpensive compared with gas boiler parts. Thus making electric boilers easier to repair and maintain. The main heating chamber has no internal restrictions, therefore not prone to blockage. The boiler is also digitally controlled, allowing it to regulate precise temperatures. 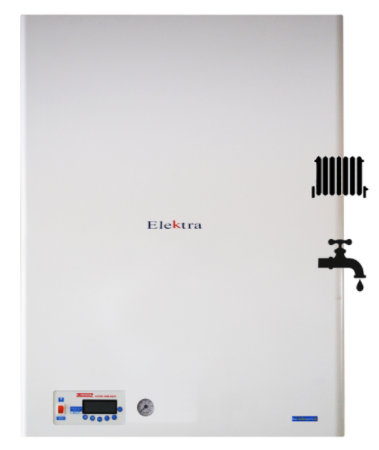 The Elektra BP12 electric combi boiler is fully IMQ tested, CE marked, and is the only boiler in Europe to give continuous hot water at 12l/min for a long period of time from a 37.5 litre cylinder. This is achieved by the 12kW heaters coming on immediately to replace the used hot water from the cylinder. 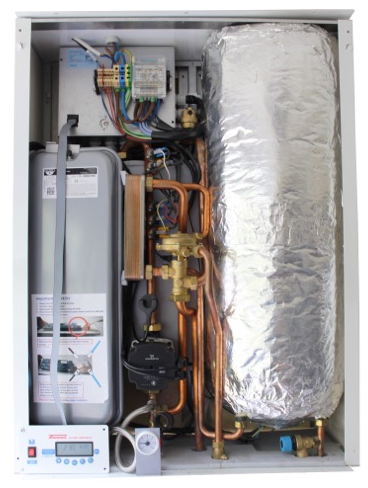 The main heating chamber and hot water cylinder have no internal restrictions, meaning they are not prone to blockages. The boiler is also digitally controlled, allowing it to regulate precise temperatures. • Elektra, designed and produced in Italy. 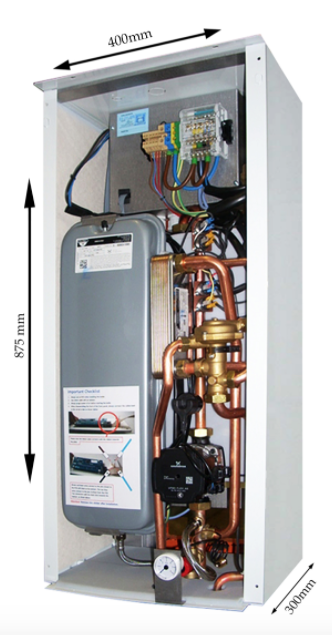 • Clean and safe form of heating and hot water solution. • Continuous hot water for its size. • 240v single phase. *Uses 50-60Amps * Use 10mm cable. • Completely silent due to Triac Based Technology. • Modulates from 2kw – 12kw. *Digitally displayed temperatures. • 37.5 L glass lined, insulated steel cylinder with inspection flange, fitted with magnesium anode, mounted with in insulated boiler casing. • Can be used with radiators or under floor heating. • Anti Legionella function. 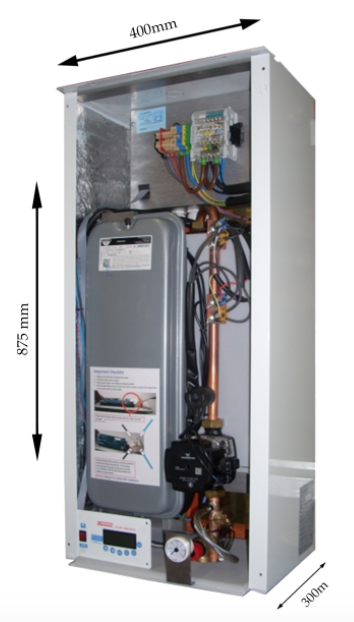 The temperature of the cylinder is automatically raised to 65oC in order to eliminate Legionella bacteria. Simply connect flow and return from heating circuit and cold supply for HW. 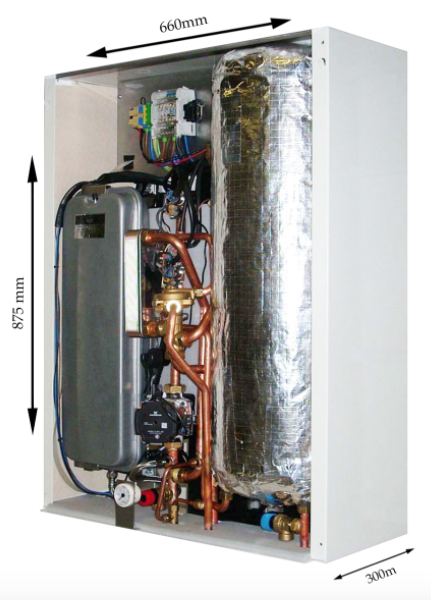 • All components for normal function of the Combi boiler are included. • Hot water limited to 65oC *Central heating limited to 75oC. • Economical (see blue chart ) installer and user friendly. • 2 Years warranty (extendable).